Good news for tiny houses on foundations in Massachusetts! Appendix Q has been voted through by the BBRS. This is not the end of the Tiny House Appendix’s journey to adoption, but it was an important step. 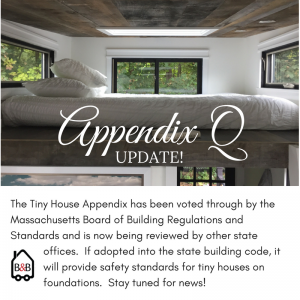 The Tiny House Appendix has been voted through by the Massachusetts Board of Building Regulations and Standards! It is now being reviewed by other state offices. If adopted into the state building code, IRC 2018, it will provide safety standards for building tiny houses on foundations in Massachusetts. Read the previous blog post on Appendix Q in Massachusetts here. At this point, there’s not much action the public can take except wait until it is reviewed. We haven’t been given a specific time frame for when the Appendix would be adopted. Assuming it will be adopted, it will then be up to each city and town to decide to call tiny houses on foundations legal, a decision which will be based off existing code which might exclude houses under a certain square footage, etc. While there is still a lot of work to be done on a local level if this does pass, for now, we’re waiting. “Board members voted to advance adoption of the tiny house appendix, at least conceptually. Among other things, Governor Baker’s Executive Order (EO) 562 requires agencies to review all regulations to ensure that they are not burdensome and\or cost prohibitive. Additionally, Building Code Coordinating Committee (BCCC) mandates regulatory review to ensure that regulations do not conflict and\or duplicate requirements so as to cause confusion to the user or enforcer. Accordingly, the measure will be advanced through each process over the next month or so. At the same time, Board members have requested a review of all 2018 I-Codes for which they have jurisdiction with the thought of advancing the entire code to the more current documents (rather than piecemeal adoption). Board members will not meet again until August 14th where the conversation will continue. In the interim, we will explore the likelihood of advancing the entire code or just pieces (i.e. Appendix Q). What is The Tiny House Appendix? Appendix Q addresses building code standards for small houses on foundations that have already been adopted into the 2018 International Residential Code (IRC), including standards for lofts, stairs, egresses, and ceiling heights. To be clear, the adoption of the Tiny House Appendix won’t completely legalize tiny houses in Massachusetts– that’s up to each city– but if it is adopted, it will provide a set of building standards for under 400 sq ft homes where they are legalized, and where they aren’t yet legalized, help legitimize tiny homes in the eyes of local building departments. Appendix Q does not address tiny houses on wheels, as they are currently considered vehicles. Read the Tiny House Appendix here. Andrew and Gabriella Morrison have been instrumental in writing and getting the Tiny House Appendix adopted into the national 2018 IRC: now it’s up to each state, and then each city/town in each state, to adopt it into their specific building code. Andrew presented at a Massachusetts BBRS meeting, introducing Appendix Q last fall.